﻿ For year, I’ve been making images in wonderful places like Yosemite, Mexico, the Eastern Sierra Nevada mountains and even Hawaii. For this composite image I took one of my shortest trips yet; I walked through my patio door to the backyard. I’ve never had so much glass hanging off the front of my camera, ever. The resulting exposures were in a “normal” f/8, 200th, ISO 200 range and I was pleasantly surprised by the results. 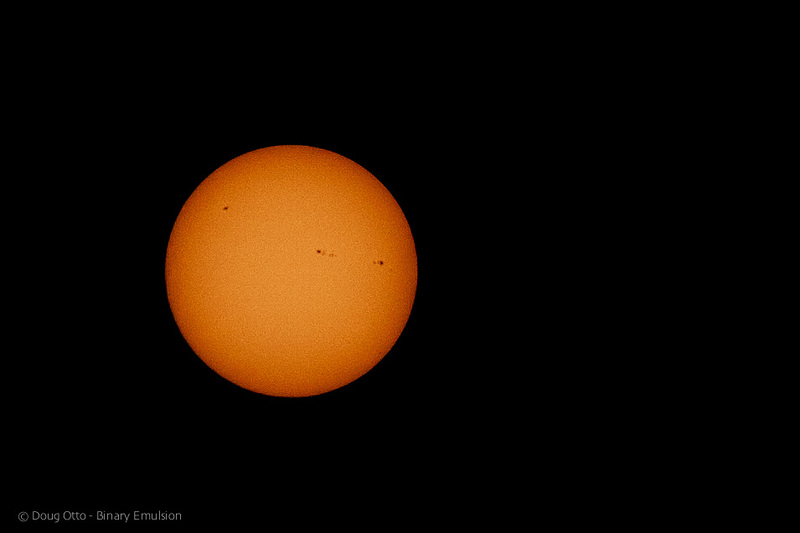 Earlier in the day, I snapped a shot of the un-eclipsed sun while checking my filter combination. It too, turned out far better that I’d hoped. With the next solar eclipse, visible in the United States, not until August of 2017, I was thrilled to be able to experience the event from the comfort of our own yard. In between shots, I sipped ice tea, played with the kids and admired how the garden is coming along. Not a bad gig. This entry was posted in Photography and tagged Canon 5D, Canon 70-200 f/4, doug otto, eclipse, filters, Photography, sun. Bookmark the permalink.